"The first edition of Documents of Texas History had 126 primary documents, ranging from a report of the first Spanish exploration of Texas to the official meteorological report on Hurricane Carla in 1961. The 320-page revised edition offers fifteen additional documents, from material on the Kennedy assassination to the Dallas Cowboys. Documents of Texas History contains a lot of useful primary source material""--Mike Cox, More Basic Texas Books Documents of Texas History, a valuable reference work for students, teachers, scholars, and history aficionados, provides an in-depth, firsthand understanding of Texas history. The 141 documents selected for this book are accounts of significant events in Texas history, beginning with Cabeza de Vaca's 1528 expedition and ending with the national influence of the Dallas Cowboys ("America's Team") and their Super Bowl victory. In between these two events, separated by more than four centuries, are scores of documents on a broad range of social, cultural, and political events which have shaped the history of Texas and often affected the nation. Fascinating to read, they relate history as it was lived by the participants and their contemporary observers. The documents are drawn from a great number of sources: archives, historical periodicals, rare books, government publications, and newspapers. They are arranged in chronological order and each document is prefaced by an introduction that provides background and interpretation of the event or topic at hand. The editors' careful selections provide an excellent overview of Texas history in all its depth and diversity. This updated edition of the classic Documents of Texas History presents Texas history as told by the men and women who lived it and watched it unfold. 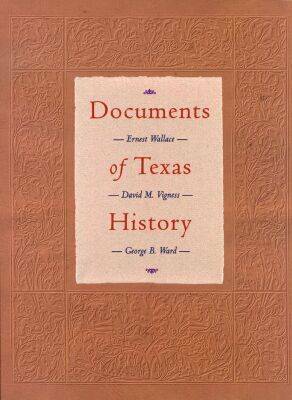 The Texas past comes alive in this superb reference volume, a valuable addition to libraries and an indispensable supplement to any work of Texas history. Selected as one of the 1990s' best Texas books, Documents of Texas History was one of 126 Texas classics included in Mike Cox's More Basic Texas Books. Publisher: Texas State Historical Association,U.S.